A man so well known to us as a Goon friend and ally. Dirk has been on the scene with the GSPS since way back so we thought it about time we did a 'profile' on him. Of course he is also well known in sci-fi circles as the man behind recreations of works on Douglas Adams' Hitch Hikers & Dirk Gently novels. One day, long ago, a young BBC Producer recreated a 'live' Goon Show for the 50th Anniversary of something, and it was a rip-roaring success. He aged terribly after that and is now 103. So happy were those of us that went out on that cold and windy night to sunny London, that we wrote all about it in one of our newsletters. That show won him Gold at the Spoken Word Awards in 2002. Previous to that wonderful event Dirk had masterminded the 40th Anniversary with "At last--The Go On Show" which came out on CD along with a digitally remastered version of "The Last Goon Show Of All" . And now, just last Christmas, December 2008, he produced, along with David Morley under the umbrella of their newly formed company, 'Perfectly Normal Productions' a show presented by Andrew Secombe entitled "Growing up with the Goons" for BBC Radio 2 (again) which included amongst its luminaries one Gill Nicholas, interviewed at her home in Cornwall by none other than the MK2 Seagoon son himself. 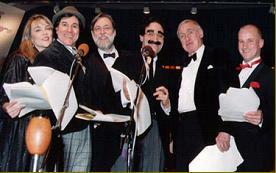 And way back, there was "Flywheel, Shyster & Flywheel", as a recreation of the Marx Bros. famous radio shows. It also won Gold in New York, USA. This is where Spike got to meet Dirk and forged the beginnings of a great friendship. Comment by Dirk Maggs himself. Radio 2 had a Goons 50th Anniversary Night on 29th May 2001. I had two contributions - a documentary I made for the 40th Anniversary in 1991, "At Last The Go On Show" and a really fun gig, a New Goon Show entitled "Goon Again". We recorded in March 2001, and it starred Andrew Secombe as his dad (! ), with Jon Glover and Jeffrey Holland in Spike & Peter's voices and Christopher Timothy as his dad, Andrew Timothy (the original Goon Show announcer). The show was supposed to run 30 minutes. But got so many laughs it went out in a one hour slot! Spike Milligan really loved it although he was too ill to attend on the night. A career highlight for me. It took 10 years and a lot of persuading Spike to let me loose on his precious 'baby'. We took a 'long lost' script and hired a 22-piece band and The Playhouse Theatre in London, and if I ever have a 'Groundhog Day' I'd like it to be March 23rd 2001 please. We won an award with that show. My favourite audience series was a re-creation of long-lost Marx Brothers shows of the early 1930s. Although some of the old shows have since come to light, at the time we recorded these it was like opening Tutankhamun's tomb, a treasure horde of delightfully crazy humour. The great thing about audience shows is doing the effects live on stage. BBC Radio Light Entertainment tended to have the effects operator hidden away behind curtains so they wouldn't distract the audience! A few Light Entertainment Producers like me have reasoned over the years that the spot effects are part of the entertainment so we brought the operator out front. And in the case of 'Flywheel' we dressed him or her up as Harpo! Michael Roberts who played Groucho came out with such good ad libs that I was always happy to cut scripted gags to keep them ...one great one was when he and Frank as Flywheel and Ravelli find themselves in a pigsty - the rest of the cast pushed in to make pig voices - and Mike ad libbed, 'Imagine - two nice Jewish boys surrounded by ham' - it brought the house down. I was very proud that that same show won a Gold Medal at the 1992 New York Festivals. THE ADVENTURES OF SEXTON BLAKE-DETECTIVE! Now, exactly thirty-eight years, four months and eleven days after his final broadcast, the world's mightiest and most popular detective returns to the air in the all-new The Adventures of Sexton Blake! Accompanied in his breakneck hurtle to justice by doughty (not doughy) assistant Tinker, Sexton Blake battles diabolical masterminds -- beautiful jewel thieves -- mechanical Stalins -- in locations as exotic as a portable Congo -- a second, secret London Underground -- an uphill avalanche. Encountering peril at every turn, only Blake can save the day and solve the case by outwitting his enemies in the head and out-punching them in the jaw. Billed as the "50th Anniversary Edition" nl:102 came out in May 2001 right bang on target for the Beeb's 50th celebrations of "The Goon Show". Our newsletter contained almost exclusively a lovely set of personal tributes and write-ups about a certain show and the re-recording of a new Goon Show at the Playhouse Theatre, London, earlier that year. 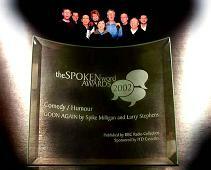 That new Goon Show was created by the producer Dirk Maggs and Spike himself over a period of about ten years. (Spike just managed to see a final copy of the script before his death and was reportedly very pleased with the outcome). The show was recorded before a celebrity audience and the GSPS were given 50 tickets to distribute amongst the members. Needless to say many of us attended and it was a night to remember. Rubbing shoulders in the bar afterwards with the rich & famous, it was a veritable Who's Who of the British Showbusiness comedy scene. Our newsletter tried to capture the flavour of that night both with photo's and anecdotes as it represented such a milestone in radio comedy history.